Factacular : Happy Black History Month! Forums > General Discussion > Happy Black History Month! 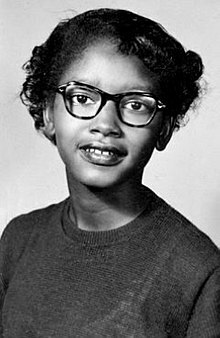 I'm always happy that Claudette Colvin is remembered on factacular (so many histories leave her out). Colvin was arrested at age 15 (in 1955) for refusing to give up her bus seat to a white women. Thank you Claudette for causing the ripple in the pond, and for your continued work for civil rights. You may not be as famous as Rosa Parks, but your act was every bit as courageous and important. Thanks for sharing that. Very appropriate too as Rosa Parks birthday is February 4th (yesterday or today depending on your timezone). These brave women made a huge difference. Really incredible to see how far we have come (and how far we have yet to go). Also hard to see so many human rights being eroded in certain parts of the world. We all need to take a leaf out of the books of these women. Agree wholly JMK, and happy birthday to Rosa as well. The erosion of rights occuring in plain daylight is shocking and frightening. I'm not a big fan of being on the grid, but have made sure to have a smart phone on me at all times to make sure my friends and family are safe. Have seen the hate escalating in Chicago lately and it is just sad. My mom was the first minority in her school at I believe every school she went to until highschool. I think my generation fails to realize how recently the civil rights movement began its work, and how easily certain sects could erase all they managed to achieve. I'm grateful for Claudette and Rosa for opening doors for all POC and hopeful that others can use their bravery as an example to continue the fight.